Longwood Gardens Chrysanthemum Festival is on view now through November 19. 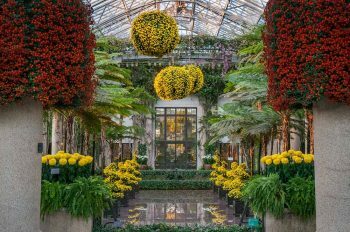 EAST MARLBOROUGH — Autumn is in full swing and so is the much-anticipated Chrysanthemum Festival at Longwood Gardens, when the 4-acre grand Conservatory is bursting with fall’s quintessential flowers. From the thousands of colorful Chrysanthemum blooms to the one-of-a-kind Thousand Bloom Chrysanthemum, the Chrysanthemum Festival showcases the traditional Asian art of cultivating chrysanthemums into grand artistic shapes. The Chrysanthemum Festival runs through November 19. “Longwood’s Chrysanthemum Festival is one of the oldest and grandest in North America,” explained Longwood’s President & CEO Paul B. Redman. “It is the most horticulturally challenging display of the year for our staff to create and is a showcase of their expertise and mastery of growing techniques that are becoming increasingly rare around the world,” he said. Chrysanthemums were first grown and displayed in the Gardens when founder Pierre S. du Pont opened the Conservatory in 1921. Today, Longwood’s Chrysanthemum Festival is an extraordinary blend of horticulture and artistry. The Festival features more than 70 large-scale topiary forms, nurtured and trained by our horticulture experts, some for more than a year, to resemble clouds, balls, spirals, pagodas, and columns of cascading fall blooms. In October, guests can enjoy the beauty of Chrysanthemum Festival daily and after hours on select evenings through October 31. During extended evening hours, enjoy lanterns aglow in our Conservatory, dine al fresco in the Beer Garden as live music provides a festive atmosphere, and take in the spectacle of an Illuminated Fountain Performance in the Main Fountain Garden. Extended evenings hours take place October 20, 21, 27 & 28 and are free with Gardens admission. For more information, visit longwoodgardens.org. In November, Chrysanthemum Festival reaches peak bloom as vibrant color fills the Conservatory. A highlight of the display is the Thousand Bloom Chrysanthemum, a single chrysanthemum plant grown to produce as many perfect blooms as possible. This year, the amazing plant features 1,443 uniform blooms and measures at an impressive 12 feet wide and nearly 8 feet tall. The Thousand Bloom is estimated to be on display beginning October 20. On November 4 and November 11, from 1–4 pm Longwood’s horticulture staff will be on hand in the Conservatory to share with guests about how they create many of the spectacular chrysanthemum forms on display, often beginning the growing process many months to more than a year in advance of the display opening. In addition, to honor the heritage and continued importance of the chrysanthemum to Asian culture, the Peter Tang Chinese Ensemble will perform traditional Chinese music from 2–5 pm in the Conservatory.